The 15 Best Christmas Tree Farms in America! It's that time of year again! The holiday season is in full swing, and with it comes the beloved American tradition of choosing a Christmas tree. And when it comes to Christmas trees, nothing compares to the feeling of cutting down your own. So gather your friends and family, don your hat and mittens, and get your hot cocoa ready. Here are our 15 favorite Christmas tree farms in America. Just two hours from New York City and on a mountain, Battenfeld's Christmas Tree Farm is a favorite spot for families to cut down their annual Christmas tree. The farm's trees are priced at $70 each, and they come in varieties like blue spruce, balsam fir, and white pine, to name a few. This Smoky Mountains Christmas tree farm specializes in "Choose N' Cut" Fraser firs, which means you choose the tree and the professionals cut it down. Grab some hot cocoa or some cider, and don't forget that the family dog is also welcome, on a leash of course. Blake Farms is fun in any season! This cider mill and Christmas tree farm offers free wagon rides and tree cleaning for holiday revelers. Stop by the cider tasting room and café when you're finished, or shop for wreaths and Christmas decorations in the gift shop. Browse over 350 acres to find your Christmas tree at Williams Tree Farm. You'll be greeted by the smell of pine and take a wagon to the fields led by Clydesdale horses. Back at the cabin, kids pet reindeer and families can warm up by the fire with some fresh fudge from the Candy Corner. This award-winning Christmas tree farm is family-owned and operated and grows only pesticide-free spruce, fir, and pine trees on a 40-acre farm. Trees range in size from four-feet to 20-feet tall, and they also sell beautiful wreaths and other Christmas decorations. If you're looking for a family-friendly farm where you can cut your own tree and entertain the kids with holiday festivities, look no further than Tom Sawyer's Christmas Tree Farm and Elf Village. Started by a real person named Tom Sawyer, the farm comes to life every Christmas with Elf Village, a collection of tiny, whimsical Christmas cottages for kids to explore. Take a horse-drawn sleigh to the balsam fir Christmas tree fields for a true Vermont winter experience. The Russell Farm's cabin sells homemade cookies, maple syrup, and Christmas wreaths, and it also has a warm, crackling fire. Trees are $75 with a sleigh ride and $45 without. With six types of Christmas trees on offer, including spruces, firs, and pines, Hann's is a popular tree farm in Wisconsin. But many people also visit for the full holiday experience, which includes woodworkers making home décor, a gift shop, hot cider, and a Holiday Haystack Playground for the kids. The "oldest and largest" tree farm in northern Illinois, Oney's Tree Farm has been open for over 50 years. The farm grows nine different varieties on 60 acres of land, and offers free sleigh rides and lots of holiday shopping and family activities in the historic barn. This quaint, family-oriented farm sits atop a hill, with 40 acres of beautiful Christmas trees. 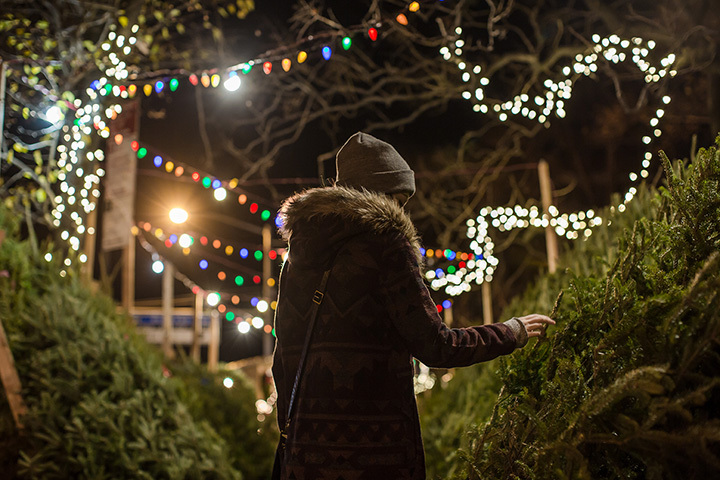 Four different fir tree varieties are on offer, and complimentary handsaws are provided. Back at the log cabin gift shop, families can enjoy fire pits, train rides for kids, Santa visits, food, and 1955 antique fire engine to take pictures with. Located at the foot of Mount Hood, Rainy Mountain Farms is known for its huge, beautiful Blue Spruce and Noble Christmas trees. Cut down as much as you want, and they will use the rest of the tree to make wreaths and boughs. While there, enjoy hot chocolate and check out the goats, bucks, and firewood. With free wagon rides and free coffee or hot cocoa, it's easy to see why Richardson Christmas Tree Farm is a family favorite. Open daily until Dec. 23, visitors choose from seven tree varieties and enjoy kettle corn, homemade fudge, and donuts in the heated barn. If you're looking for a high-quality, environmentally responsible Christmas tree, head to Candy Cane Christmas Tree Farm. This sustainable farm uses drip irrigation and hand shaping to produce the most ecologically-friendly trees. You can also browse their fresh-made custom wreaths, garlands, and other holiday décor while sipping on hot cider and hot cocoa in the barn. Families who visit Pinecrest for "Choose & Cut" trees can choose from six varieties, including firs, spruces, and pines. There is a large Christmas shop and both horse and tractor rides out to the fields. The family-owned and operated farm has been expanding and is open until Dec. 23. With balsam firs, Fraser firs, concolor firs, and blue spruce Christmas trees, Ellms Family Farm has a lot to offer families in the Saratoga area. Holiday visitors enjoy free hot cocoa, trolley rides, and tree baling if needed. Enjoy a light lunch and homemade cider donuts, and visit Santa and the new "chicken carolers."